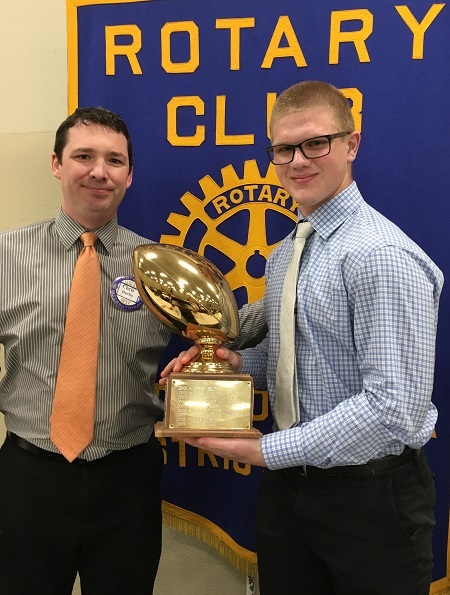 Since 1946 the Waterloo Rotary Club has enjoyed the honor each year to celebrate outstanding performance by high school athletes in the city of Waterloo and surrounding areas. Football coaching staffs at each school in the city nominate a senior MVP from their team. In a secret ballot, area sportswriters make the citywide selection. The winner receives the Glen "Doc" Miller traveling trophy as top player in his sport. The winner is entitled to display the trophy at his school for the next twelve months. This regulation-size gold football, mounted on a base, is a travelling trophy given each year by the Downtown Waterloo Rotary to the outstanding player in football in the Waterloo Schools. It is given in memory of an outstanding Rotarian, Glen "Doc" Miller, a great athlete and president of the Waterloo Rotary Club in 1954. "Doc" was captain of the University of Iowa football team in 1923, and a player on the great Iowa teams of 1921-22 which beat Yale. Awards are presented at a luncheon attended by Rotarians, the senior players from each of the area teams, their coaches, parents, and honored guests. Scroll down to see pictures of the MVP picks from each school. Special thanks to the 2018 Rotary Football Committee and volunteers. Thanks Mason Fromm for photography and webpage.